Rust Treatment converts rust to a dark protective polymeric coating. 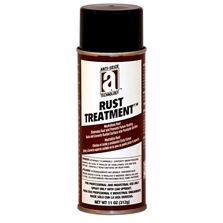 It changes existing rust to an inert coating that seals out moisture to prevent future rust and corrosion. Applications: All rusting steel and iron. May be applied with a brush or roller. Product arrives ready to use.